We think we all want to have a mini-sub of our very own, don’t we? 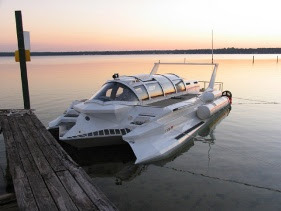 Well, we know that we do, which is why someone invented the Marion Hyper-sub powerboat. The Marion is able to achieve 75 kilometers per hour on top of the water with an 880 horsepower engine. We don’t know much about submarines, much less mini-submarines, but that seems a little fast. Of course, what you really want is it to go under the water, and it can go to depths of 250 feet. So far, test dives have clocked this thing at going one hour and 45 minutes using cabin air submerged. Granted, that isn’t long enough to do much, but hey, it’s submersible! We have no idea of its speed underwater. The Marion Hyper-sub powerboat is clearly designed to be the envy of the yacht club. You will not its awesome transparent roof as well as its streamlined design. The front has the fins of a Cadillac! Well, we don’t know what something like this will cost, but as the saying goes: “if you have to ask, then you can’t afford it”. We already know we can’t afford this. Perhaps one day we will know someone rich enough to take me for a ride someday.